Imagine Stephen King’s “Christine” and “Maximum Overdrive” with nothing under their hoods. Imagine “The Hitcher” without the psychotic Rutger Hauer. Imagine “Texas Chainsaw Massacre” minus Leatherface, Grandfather … and power tools. So what’s left? Not much besides long hot patches of asphalt. Dupieux’s first English-language production may be the ne plus ultra of minimalist horror films. It’s a variation on Spielberg’s “Duel” and King’s demonic gas-guzzlers told from the perspective of ‒ hold onto your carburetors, kids ‒ a killer tire. “Rubber,” now on PPV, is prime Midnight Spooker fare. It’s about a freakish Firestone that rises from the desert, takes a few wobbly rotations and then rolls merrily along, stopping only to flatten plastic bottles and scorpions. Initially tentative, the tire discovers it has telekinetic powers and soon works its way up the food chain, from rabbits and crows to clueless humans whose heads, a la Cronenberg’s “Scanners,” explode like watermelons. As this is going on, an audience watches from a bluff through binoculars. It’s a mixed crowd ‒ father and son, bored teenagers, veteran in wheelchair (Wings Hauser), etc. ‒ which allows Dupieux to comment on the general state of movie audiences today. They talk, sleep, video and frequently interrupt the action. But not to worry, Dupieux, standing in for all filmmakers, exacts sweet revenge. 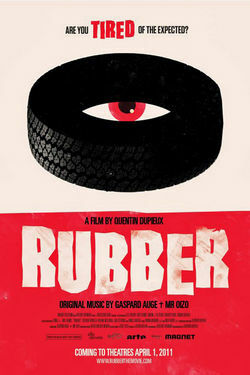 I was prepared to hate “Rubber,” which struck me as a bad student film, i.e. pretentious. 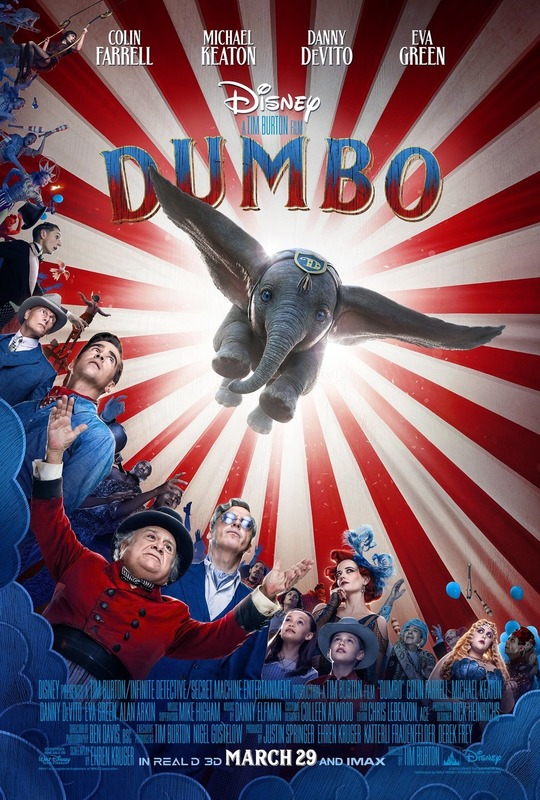 It opens like Beckett or Ionesco with a stage manager (Jack Plotnick) setting up chairs and a sheriff (Stephen Spinella) climbing out of the trunk of a squad car to deliver a speech about all films — “E.T.,” “J.F.K.,” “Chainsaw Massacre” ‒ possessing an element of “No Reason.” This is Dupieux expounding on movie logic, where nonsensical things occur because they must, to further the narrative and force an implausible outcome. Needless to say, a little of this goes a long way. But just as I was about to write “Rubber” off as the year’s “Attack of the Killer Tomatoes,” something only an incorrigible horror buff could love, the tire began to gain traction and exhibit human-like traits: anger, fear, joy, fatigue. In one scene, reminiscent of “The Red Balloon,” it admires its own vulcanized countenance in a mirror. In another, it pulls a Norman Bates, ogling a woman in a motel shower. The tire’s taste in TV? Aerobics and NASCAR are expected, the Nature Channel less so. Figuring inanimates attract, the cops tempt the killer with a curvy mannequin strapped with TNT. Talk about your synthetic seductions! Spielberg announced his arrival with a killer truck. By making us believe in a thinking tire, Dupieux has outdone him. Appropriately, in this film’s parting shot, the Hollywood sign beckons. Wow, you really sold it to me (I thought the review was heading to the 3 dagger arena). I’ll definitely check it out. And that’s a killer poster, too!